C-Level technologists and HR leaders use us as part of their strategy to develop their technologists into magnetic leaders. How to create better leaders faster. Download our guide on how you can create better leaders within your teams. 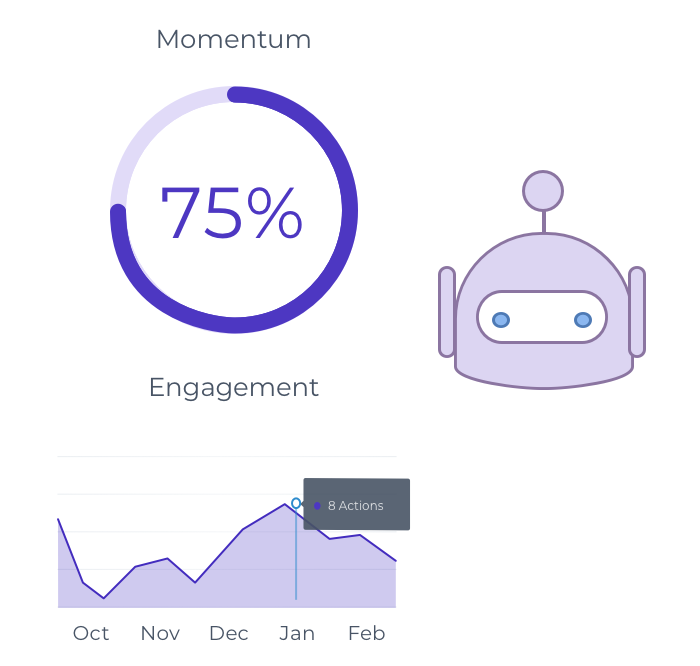 Actionable insights you can implement today. Advice from the CTOs of NASA and DailyMotion. Solutions – How do we fit into your strategy? Content to fuel your existing efforts. Customers use our content to keep the conversation and momentum going during in-between conferences, workshops and more. A full leadership development strategy. We offer full end to end leadership development strategy where we mentor and grow your people with you. Get the most out of your current leaders. Duration: 6 or 12 months. Rolling engagement available to all of your first time leaders. Not all technologist want to be people leaders, some want to lead in their technical craft. Duration: 6 and 12 month options. Exclusive: Made for only C-Level technology leaders that lead over 100 people. We have large discounts for multiple users so it’s budget friendly to deploy LeaderBits to all of your leaders. Inspired by best technology leaders on earth. We’ve interviewed and extracted advice from the top technology leaders in the world. Individuals who’ve gone from individual contributors to the leaders of the largest companies on earth. Each week your leaders will spend 10 minutes taking action advice from one of the greatest technology leaders on earth. First, your leader completes a strengths assessment. 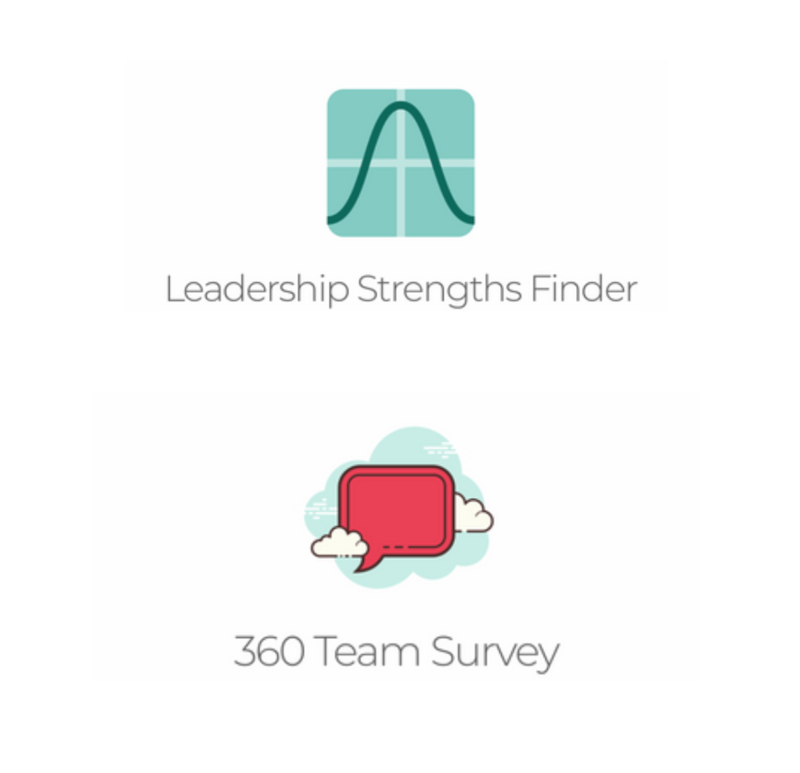 Next, your leader sends an Anonymous 360 survey to their team enquiring about their leadership strengths. How does your team see your leader? What areas do they believe they’re strong in, and could improve in? 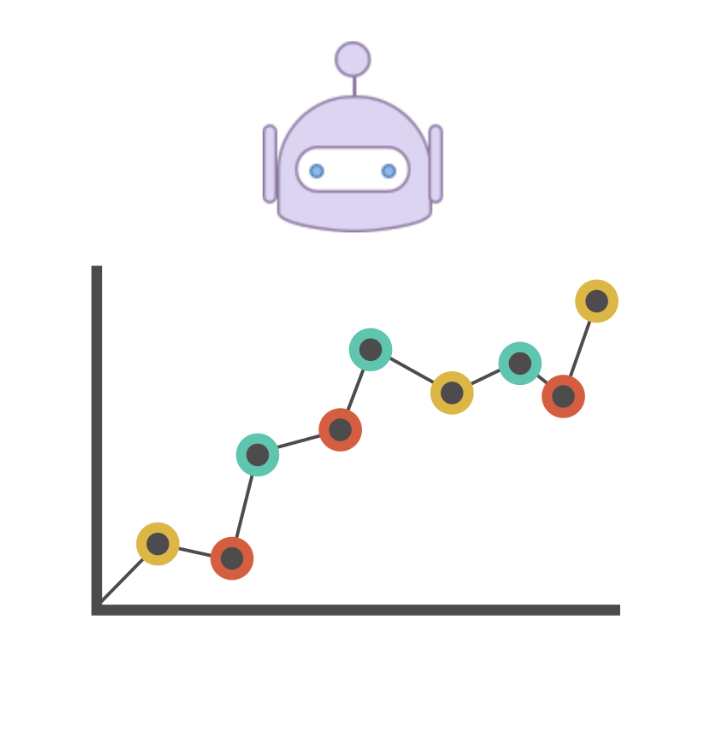 The data from their feedback is then used by LeaderBot to create a personalized set of actions they will take throughout the program with their team. These actions are designed to raise their level of influence with their team to make them more effective, valuable leaders. Part 3: Their first challenge begins! After the onboarding process your leader immediately begins taking action by completing their first challenge. We source our advice through interviews on the Modern CTO podcast with the greatest technology leaders in the world, such as Microsoft, NASA, Symantec and more. We’ve already spoken to over 200 of the greatest tech leaders in the world, so we have plenty of content. We make a short clip of their best advice for our challenge. 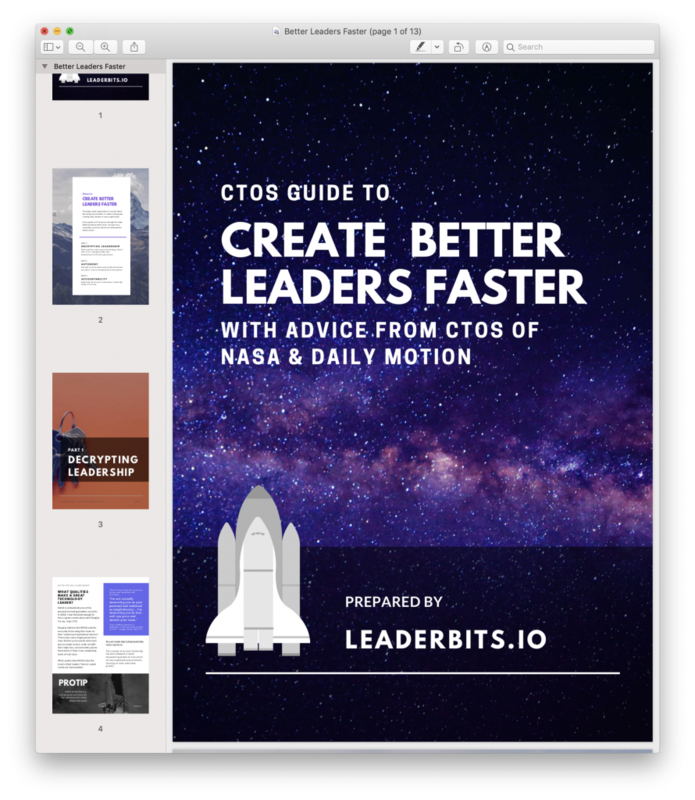 While books and other programs contains lots of great information, the LeaderBits difference is the ability to act on the information within a 10 minute window. We give exact steps to your leader on how to take action on the advice, and our advice is cross-checked for effectiveness. At the end of the challenge, leaders have a fun extra credit question. Example: “If you could have any 2 superpowers what would they be and why?” It keeps your leader engaged and is a motivating way for them to end their ten minute challenge. 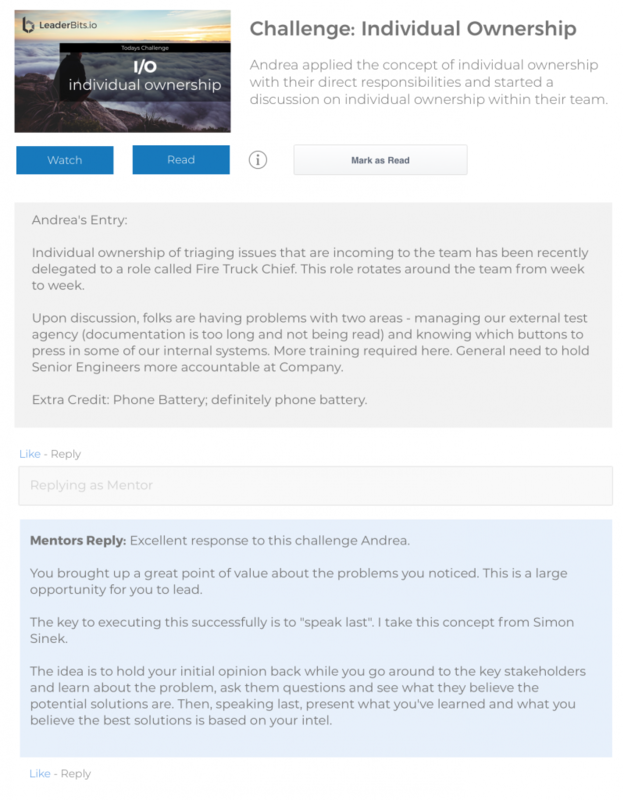 After each challenge your leader makes an entry into a reflection database, allowing them to record their experience with the action they’ve taken in the program. This allows you to see exactly what their experience and thought process was with the challenge, and track their progress. By having access to this qualitative data, it gives you the ability to see inside their mind to know how they think as a leader. This is an incredibly powerful tool to have for mentoring and data to have when making a decision of who to promote further as a leader. 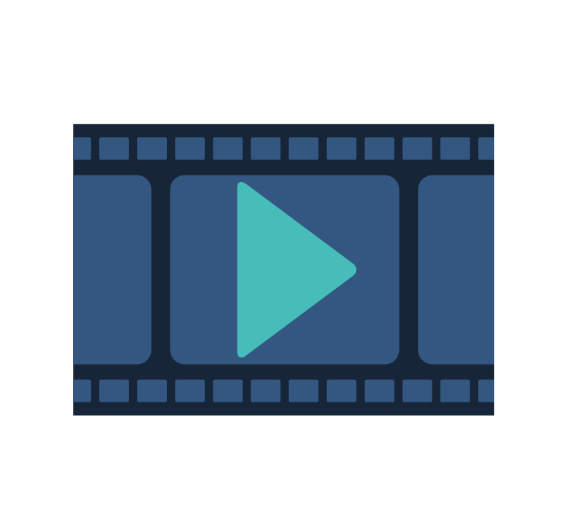 Leaders will develop through ten minute ‘challenges’, which are interactive videos that drive both action and reflection. Can I see an actual challenge example? Absolutely here is a sample of the challenge “Giving Credit” keep in mind that it’s a single challenge sample for you to see the format. The program is tailored to your leader and builds overtime. Our dashboard shows you teams and individuals progress. See the actions and behavior your leaders are taking across your organization in one simple view. See who is progressing as a leader. 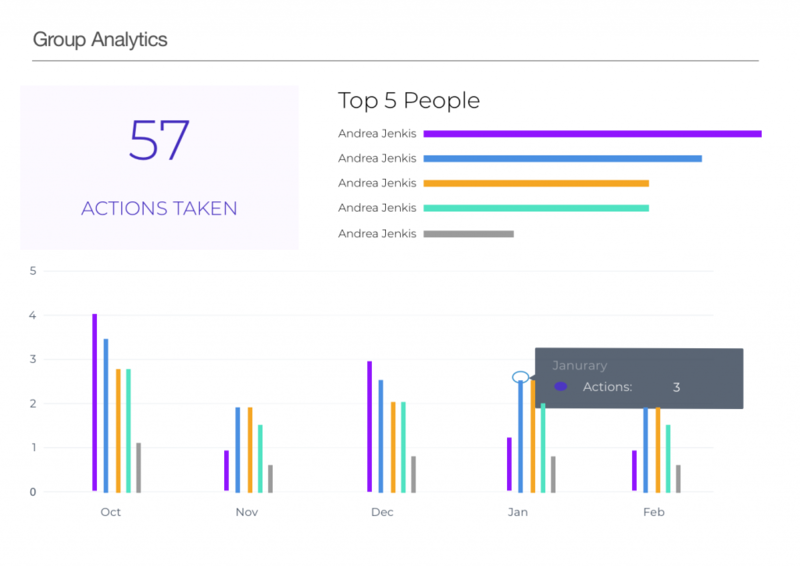 Toggle between a specific groups analytics, the organization or just an individual. You get more than just a checkmark or a notification content was “viewed”. You get to see directly inside the leaders mind and mentor them. This allows you to gauge the leaders maturity and step in to correct or complement behavior. Our friendly leadership robot works 24/7 for your benefit. You won’t have to hunt down or build complex reports. Each week you’ll receive a customized report directly to your inbox. This allows you to showcase value of the program to your organization instantly. Everything we do is measurable so we can accomplish our mission of better leaders faster. We run surveys before and after participating in LeaderBits to show the effectiveness. Below is an example. On the left you’ll see the 360 survey results from before LeaderBits and on the right after. After LeaderBits we saw an increase in how the team viewed the leader. Also, we saw a 200% increase in the leaders confidence in their ability to lead. It’s your leadership program and that’s how it should look! We customize the portal to your brand so it feels like home. 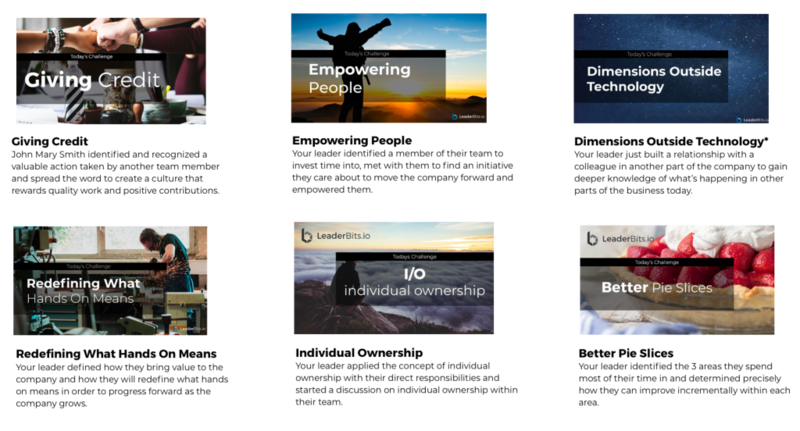 API’s, Single Sign On, LDAP, all the features you’d expect to seamlessly connect your leaders into the finest leadership program on earth.